In a bowl, combine heavy cream and condensed milk. Using a hand mixer at low speed, whip mixture until it reaches firm peaks. 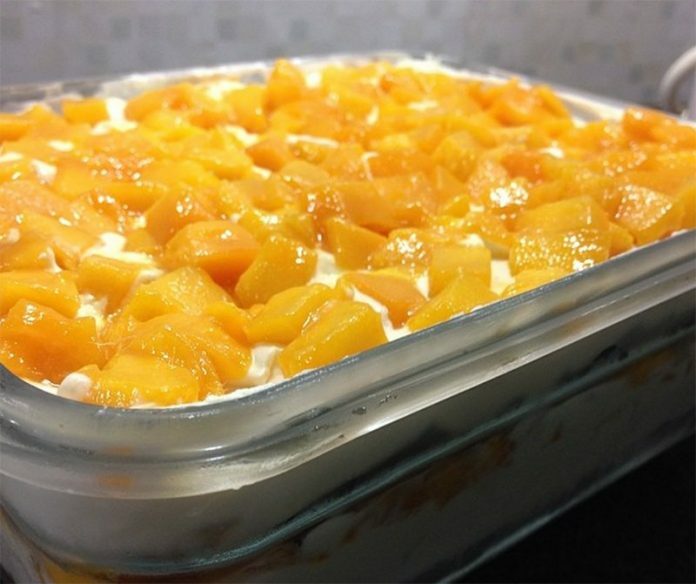 – — Gently fold in ½ of the diced mangoes, making sure not to deflate the whipped cream. If using mango puree, omit diced mangoes and gently fold in mango puree into cream mixture. Arrange one layer of graham crackers on bottom of baking dish, breaking pieces as needed to fit sides. Spoon ⅓ of cream mixture on crackers and spread to cover. Arrange another layer of graham over cream. Spoon and spread ⅓ of the cream mixture. Repeat with another layer of graham crackers. Spoon and spread remaining ⅓ of the cream mixture on top of crackers. Arrange the remaining diced mangoes on top of cream. Cover tightly with plastic film and refrigerate overnight. Freeze for about 1 hour before serving. To serve, lift cake from pan using parchment paper overhang as support and transfer onto serving platter. Cut into serving portions. In a saucepan over medium heat, combine mangoes and sugar. – – Bring to a boil, stirring occasionally, until sugar is melted and mixture is very thick. Allow to cool completely.